We had thirteen (13) different models of the best cordless hedge trimmers, from twelve (12) different brands. Included in the bout were the typical professional lawn equipment makers, in addition to players from cordless power tool world, as well as the newer cordless lawn tool specialists. Without further ado, the Best Cordless Hedge Trimmer Shootout entrants were: DeWalt DCHT860X1, ECHO CHT-58V, EGO HT2400, Greenworks Commercial GH 260, Greenworks Elite HT-240-T, Husqvarna 536LiHD60X, Makita XHU04PT, Milwaukee 2726-21HD, Oregon HT250, RyobiRY40610A, Snapper SXDHT82, Stihl HSA 66, and Worx WG291. We pride ourselves at OPE Reviews with bringing objectivity wherever possible when performing reviews, and especially shootouts. What this means is that we try to test in a way that we can not only measure but also deliver repeatable results. Having said this, we also understand that some categories, such as ergonomics or comfort are hard to score with scientific evidence. In these opportunities, we gather feedback from many different users to ensure that we have sufficient data for scoring as such. We use a 100-point system in our final tally, with the “leader” being the hedge trimmer closest to 100. Another great shootout is our Best Backpack Blowers. Check it out! We know how you are, so we’ll just get into the results. First up in our tests for the Best Cordless hedge trimmer shootout was our dowel gauntlet. We used 54 different dowels, using four different sizes to simulate a hedge. While the dowels may be made from a different composition than hedges, it definitely keeps the playing grounds even for everyone. Each hedge trimmer made three passes on the dowels, and the corresponding time was recorded. The leaders in the dowel gauntlet were the EGO, Greenworks Elite, and the STIHL, recording a time of 15.0, 20.5, and 23.1 seconds, respectively. Some of the hedge trimmers had some trouble allowing multiple dowels into their cutting blade at the same time. As we’ll discuss later, none of the trimmers had any trouble actually cutting the wood, it was just getting these branches, dowels, or limbs into the blade. Let us first declare that none of these hedge trimmers have any trouble handling typical hedge trimming. In other words, keeping up and maintaining hedges, cutting new growth, small twigs and leaves, you’d probably be satisfied with any of these thirteen in our Best Cordless Hedge Trimmer Shootout. With the dowel test being our first test for the hedge trimmers, there was some concern that the dowels may not be the best test for simulating a real hedge. After using all thirteen (13) hedge trimmers on different real hedges, from many different lawn care professionals, we confirmed this test is/was accurate. The same units that posted slower times in the dowel test were also slower at cutting hedges, in the thick stuff. Hedge trimmers that performed better seemed to almost invite the branches into the blade, whereas the others seemed to have a little more trouble making the cut. Calculating the usage performance for the best cordless hedge trimmer shootout included more than just cutting the plethora of dowels. We also took into account the cut capacity, measured at the blade opening, as well as the cut quality, which is a bit more subjective. Most all of the hedge trimmers had a cut capacity very close to 0.75-inches (¾”). The Worx, Makita, and Greenworks GH 260 had a little less capacity, at just over 0.60-inches. These measurements were taken with the same set of digital dial calipers. When it comes to batteries and cordless tools, don’t get confused with the numbers thrown about. Much of the time, each manufacturer brags about some big number, either Volts or Amp Hours. Independently, these don’t mean much, however together, you get the important one, which is Watt Hours Output. From our contestants, we had everything from 18V, all the way to 82-volts. For reference, the single 18-volt had a much longer runtime than the 82V. Top runners in the runtime test were the STIHL HSA 66, Milwaukee 2726, and the Oregon HT250. Finishing 2nd, the Milwaukee included the single 18-volt 9Ah battery, running a brushless motor, extending runtime to almost three hours (2:49:54). Oregon finished 3rd in runtime, powered by their 40-volt battery, posting just over two hours (2:07:47). DeWalt also posted a very close 4th-place finish, with their 40V hedge trimmer running over two hours as well (2:02:16). Astonishing us all was the time that the STIHL HSA 66 ran on their AP300 36-volt battery. We kept checking on the hedge trimmer throughout the day, as it seemed to run in infamy. Finally, after nearly five (5) hours, it slowed down to a crawl. It actually never completely stopped…we just called it done after 4:48:45. One thing that is always hard to argue is the effect that gravity has on the tool in your hand – weight. Lighter tools definitely feel better on the back, arms, and shoulders, especially when trimming the tops of higher hedges. At the same time, getting too light may also come with a lesser build quality, and/or lack of serviceability and features. All weights include the tool, with the included battery attached, but without the blade guard/sheath. Coming in at the top, with the least weight, is the Greenworks Elite 40-volt HT-240-T, at just 7.8-pounds. Ryobi’s RY40610A and the EGO HT2400 weighed in at just 9.0 and 9.4-pounds, respectively, for 2nd and 3rd lightest hedge trimmers. Greenworks 40V – 7.8 lbs. Ryobi 40V – 9.02 lbs. EGO 56V – 9.4 lbs. It is worth noting that none of the top three in this category have serviceable gearboxes, so it’s arguable that they may not fit for some Pros. The lightest of the bunch with a serviceable gearbox was the Oregon HT250, weighing just 10.3-pounds. Furthermore, our calculating takes into account serviceability, reducing the scores of those that don’t have it. In addition to weight, the balance of the hedge trimmer also gathered attention, unanimously, from our Pro’s feedback. Some of these units in our best cordless hedge trimmer shootout seemed to carry a lot of the weight on the backside. This not only pitches the hedge trimmer with the blade-high, but it also proved to be more of a pain when trimming overhead. To overcome just listing individual subjective information about the feel and cut of a hedge trimmer, we have several pros and multiple users cut with each hedge trimmer in a blind-test. No, the users were not blind or even blindfolded, but we made sure to not share any data or information with them before they completed using all the trimmers. After using each unit in our best cordless hedge trimmer shootout, the user made notes of any features and/or performance items. Once they completed using all the trimmers, they each ranked all thirteen (13) cordless hedge trimmers. Taking the rankings and information from all the users, we are able to rank and calculate points from the testing. Leading the user-calculated comfort and performance was the EGO HT2400, Husqvarna 536LiHD60X, and the Makita XHU04PT (1st, 2nd, and 3rd). Also added in the score are the features that each trimmer had, or didn’t have. When it comes to hedge trimmers, it’s not like there are tons of options and features to choose from. However, there were a few items that made life easier for the operator. Five hedge trimmers include a rotating or articulated handle. The handle and controls rotate 90-degrees each way to allow the operator better control when trimming the sides of hedges, or the top. The Greenworks 40V and 82V, Husqvarna, Makita, and the Snapper all had these rotating handles. Deactivating the safety switch for the trimmers differed for some. Some had the ring under or just behind the secondary handle (the handle by the blade), which gets depressed by the forward hand, allowing the throttle to engage the blades. Others use a separate lockout switch that must be unlocked before the throttle is depressed. The Greenworks GH 260 and Snapper had electronic lockouts, requiring the user to depress the power button before power is sent to the blades. The all-around favorite method seemed to be the extruding ring around the secondary handle, this easily starts and stops the unit when the hand is added or taken away. This also doesn’t require a second motion. The Ryobi 40V RY40610A hedge trimmer is the only trimmer that included a hedge sweep in the kit. Some other manufacturers offer this as an add-on, but the Ryobi comes with. It easily slides onto the blade housing, allowing the user to sweep off leaves and debris atop the hedges when trimming. Obviously, if we’re looking at these cordless hedge trimmers with the possibility to make it into a landscaper’s trailer, then we have to look at build quality. Some of the trimmers in our shootout immediately standout with a more commercial/industrial build – better durability. The Greenworks Commercial GH 260 and the Snapper SXDHT82 share the top spot for build quality. If these look remarkably similar, it’s because they are both made by Greenworks. Following close behind in build quality are the Husqvarna 536LiHD60X, ECHO CHT-58V, and the STIHL HSA 66. Our calculation of value takes in much more than just the cost of the hedge trimmer. We also look at feature sets, build quality and all the other important aspects, in order to determine a baseline for what you get for each valuable dollar that you spend. 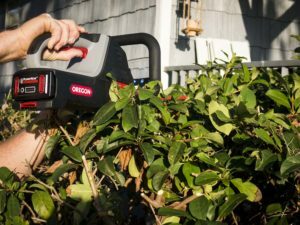 Prices for these best cordless hedge trimmers vary as much, or more, than the weights. Our prices reflect the “street-price” of each unit, with the battery and charger included. The cheapest of the bunch is the RYOBI RY40610A with a cost of just $149, including the 40-volt battery and charger. At a close 2nd is the EGO HT2400 at just $169, including the 2.5Ah 56-volt battery and charger. And, the 3rd cheapest is the Greenworks Elite 40-volt HT-240-T with a cost of only $179. The WORX WG291 was the only other cordless hedge trimmer to come in less than $200 ($199). As we mentioned in the beginning, this shootout didn’t come down to runtime and power as the holy grail. Why? Because all of the hedge trimmers ran longer than an hour, which is surprising in itself. Also, none of the hedge trimmers had trouble cutting through branches, as far as power is concerned. More of the issues came down to blade design and how well the branches were fed into the blades to be cut. Also, this is a tool that gets lifted over your head, down below your waist, and such. Hence, weight and ergonomics play a huge role. I do believe that the cordless hedge trimmer will find its way into the lawn trailer for many Pros, at least for a supplement. Furthermore, many of these units cut as well, or better, than competitive gas-powered machines. You see the benefits – you make the call. What say you? Overall Winner – STIHL HSA 66 – 87 pts. So, it’s time to get down to brass tacks here, finding the best cordless hedge trimmer. We’ve broken it down into the different categories and scores, so now it’s time to see the final tally. Chances are, you’re not even reading this, so I could write anything I want. You probably just scrolled right past, looking for the winner at the bottom. Ok, here goes. Spoiler Alert: STIHL HSA 66 wins with 87 points out of 100 possible. EGO finished a close 2nd at 82 points. ECHO and Milwaukee tied for third-place, with 81 points. Build Quality topped the charts for the Greenworks Commercial hedge trimmer. This 82-volt hedge trimmer has a blade and blade-guide that hindered it in the cutting performance. It definitely took more effort to cut larger branches with the Greenworks GH 260, due to the blade design. There was plenty of power, but the hedges just didn’t seem to make it into the cutting area. The Oregon HT250 suffered from being mediocre, and not being a real leader anywhere in the testing. It didn’t suffer from lack of power, but it did have trouble cutting some branches. The blade geometry just didn’t work well for this 40-volt unit. It did have a decent runtime, eclipsing the 2-hour mark, and it also has a serviceable gearbox. While the Worx WG291 will not be the go-to for the true professional, due to build quality, this cordless hedge trimmer did remarkably well. It’s also hard to beat the price, less than $200. For the homeowner, or for a supplement tool to a gas trimmer, the Worx WG291 might be a great choice. The Greenworks GH 260 and this Snapper SXDHT82 share many features and characteristics, however, they did perform a lot different. First, the blade geometry was different, and the blade-guide is not present on this Snapper hedge trimmer. Runtime is also much better on the Snapper, even though the batteries are near the same. The Snapper does suffer from being heavy and the price is high as well. Build quality is very good. Makita is a tried-and-true tool company that manufactures hundreds of different tools for the professional. The Makita hedge trimmer uses two 18-volt 5.0Ah batteries to power the brushed motor. Runtime for the Makita was just over an hour, placing 3rd to last. It didn’t perform very well in our dowel test either, with a 2nd to last place finish, at 45.9 seconds. The Makita hedge trimmer does have a rotating, or articulated, handle to make cutting overhead and sideways much more comfortable. However, the blade design doesn’t allow the larger branches to make it into the cutting area. The Makita had the shortest cutting teeth of any in our test, but it also had the longest trimmer in-whole, at nearly 26-inches. Makita’s hedge trimmer really suffered from finishing in the middle or bottom of the pack in all the tests. Ryobi is one of the DIY brands that finished very well in our shootout, just because it didn’t seem to finish in the bottom on anything. Being the cheapest of the group, this does help. However, we doubt any Pros are going to look to this, even for supplemental use. Build quality is not the best, and there is not serviceable access for the gearbox. Not only is the Ryobi cheap, it also cut very well. Weighing in at only 9.0-pounds, with battery, this was the 2nd lightest of our best cordless hedge trimmer shootout. Blade design on the little Ryobi is also good, as it was very easy to trim hedges. Ryobi actually did well being a middle-of-the-pack finisher in most of our tests, because it didn’t have anywhere that it did terribly. Middle-of-the-pack finisher in most tests. 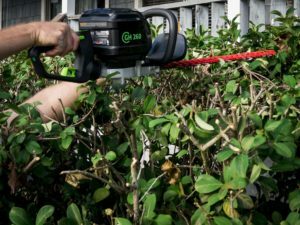 The Greenworks Elite 40-volt hedge trimmer hasn’t even officially hit the market yet, but we can see where they’re focused. It’s heavier brother, the 82V Greenworks Commercial GH 260 tops the charts in weight and near the top in price. The lighter and cheaper 40V is aiming for the opposite end, yet trying not to lack in performance. Most of the Pros were pretty happy with the Greenworks Elite 40-volt. It’s the lightest of the group at just 7.8-pounds, with the battery. Furthermore, it finished 2nd in our test, mowing down three passes on the dowel gauntlet in just 20.5-seconds. DeWalt has left their typical power tool batteries for their “Pro” line of lawn tools, including the hedge trimmer. The 40-volt platform is a battery that is made specifically for the OPE world. This DeWalt cut pretty well, however, the heavyweight – with most of it on the tail-end – makes it pretty tough to cut overhead. Runtime was decent, moving just past the 2-hour mark. There is no rotating or articulated handle on the DeWalt. On the bright side, it is priced at a respectable $249, with the 40V battery and charger. 2nd to heaviest – 12.8 lbs. The Husqvarna hedge trimmer was another that did well by not finishing at the bottom and staying in the middle for the rest. It is the most expensive unit, at $429, but it also performed very well. Husqvarna, like the Greenworks GH 260, opted for a blade-guide. Our understanding is that it’s supposed to guide the branches into the cutting area. However, we tend to feel that it does the opposite. The Husqvarna didn’t seem to suffer quite as much as the Greenworks on cut quality. Build quality is definitely a plus for the Husqvarna, and the runtime was 01:26:17. A rotating handle also helped with ergonomics. The Milwaukee 2726 hedge trimmer is a part of the M18 FUEL platform, meaning that it has the brushless motor and an 18-volt Lithium-Ion battery. This kit also includes the High Demand 9.0Ah M18 battery. Together, the high demand battery and brushless motor allowed the Milwaukee to finish 2nd in runtime, just short of 3-hours. Cut quality was very good and the ergonomics and balance were surprisingly good. The Milwaukee looks long, with the battery hanging off the back, but hedge trimmer is pretty balanced and easy to maneuver. We believe the Milwaukee could be even better with a rotating or articulated handle. A price of $299 puts it right in the middle. If you’re a lawn guy that also has Milwaukee tools, this could be a no-brainer, adding a high demand battery and rapid charger to your collection. It is no secret that ECHO is a major player in the gas-powered Outdoor Power Equipment (OPE) world. Many of the Echo tools are found in the hands of professional lawn and landscape Pros. Stepping into the cordless world, Echo wants to be a class leader here as well. The Echo CHT-58V is a good solid machine that should make anyone happy to use. The Echo hedge trimmer finished fourth in our dowel gauntlet test, finishing in just 25.0-seconds. Runtime testing wasn’t eye-popping, but it still ran for 1:19:26. For a professional lawn care brand, it seems to be priced right, at just $269 for the kit. EGO did a great job with designing the HT2400 hedge trimmer. It finished in the top-3 in four of our tests, and it never finished below 5th. In addition, the price is right for only $169, including the 2.5 Ah 56-volt battery and charger. The EGO is just easy to use and very light. It will cut anything that gets put in its path. One issue that everyone found annoying is that when you pull the trigger, it feels like an eternity before the trimmer blades start moving. In actuality, it’s probably 2-seconds, but it seems forever. EGO should really do something about this, but it doesn’t affect performance. 3rd lightest – 9.4 lbs. And the winner for the best cordless hedge trimmer shootout is…STIHL HSA 66. It literally ran off with the runtime test, lasting almost five hours. You would have to be a hedge trimming beast to need more runtime in a day. Furthermore, the blade design of the STIHL works very well to bring the branches in and cut them. As with most Stihl products, the build quality is top notch, even though much of it is plastic. The gearbox for the blades can be serviced, and the ergonomics are top-of-the-class as well. Weighing in at just 10.6-pounds, it’s very light, considering the features and quality. The STIHL HSA 66 finished 3rd in our speed test with the gauntlet of dowels. All this good news kept the STIHL from falling, even with the 3rd-highest price tag ($419). Editor’s Note: This article was originally published on February 27, 2018. It has been republished as part of OPE Reviews’ Best of 2018 series. This is exactly the kind of comparisons that I want when buying these tools. Well done. I think a topic worth exploring that should go into this decision is the ecosystem into which you are buying into. For example, are EGO/Echo/Stihl’s other tools worth using? Are other offerings poor from that same company? Do we ensure battery compatibility? Thanks for putting in this effort, it is much appreciated.